Wow, I just love getting presents. Earlier this evening I received an email from our marketing guru at Resplendence and she had attached my new cover! Woohoo! I love new covers. 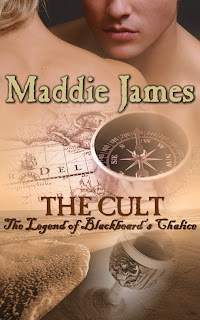 THE CULT, is book two in The Legend of Blackbeard's Chalice series. It's release date is Februrary, 2008. This story continues the saga of Blackbeard's Chalice and takes it forward in time to the present day. Victoria Porter (Jack's and Claire's daughter from THE CURSE) is the heroine and a surly, bad boy horror writer from the 21st century is her hero. I'll be posting a blurb and excerpt soon! Until then, just enjoy the cover! Oh Maddie!!! That's beautiful and it totally compliments the first book's cover perfectly! 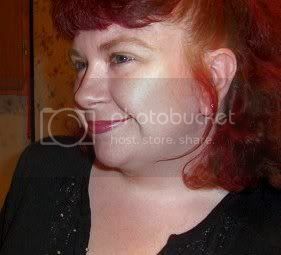 Hi Taryn! Thanks so much. I do love that cover and think there is a lot of continuity from THE CURSE. As to down time, I did get a day over the weekend in Phoenix, so had that time all to myself. I'm heading home this morning! Yay! I am ready for my own bed! Oh, I'm so glad to hear that! Do you have more traveling to do anytime soon? I hope not, I bet you could use some major down time..time to rejuvenate and get back to concentrating on writing! Since when do little girls get pedicures?